Posted by M Bharath Bhushan in Andhrapreneurship, BJP, corruption, JAC, Mahabubnagar, Mulki, Palamur, Polavaram, politics, regionalism, Settler, Sonia, TDF, TDP, Telangana, TRS, Vishakapatnam, Y S Jagan, YSR. Telangana Rashtra Sammiti chief K. Chandrasekhar Rao only got about 15 minutes time to attack YSR Congress and to some extent the BJP, when he was forced to cut short his address due to rains at the party’s public meeting site venue at Angadi centre in Parkal at around 8:30 pm. 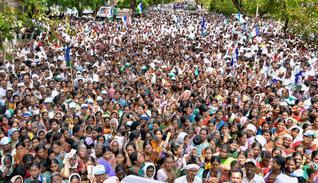 Both the rival Desam and Congress were spared of his usual barbs, thanks to the sudden down pour that forced the large gathering at the Angadi ground to stand up.